Preview's October 2011 issue is very special to me. Two of my long-time dreams came true. First, because it's my frist PREVIEW cover. I has been my dream, from the first time I bought a copy of the magazine, to do a cover for them. It has been one of my biggest goals as a photographer ever since. The second dream, another long-time dream, is that they included me in 2011's Creative It List(!!!) It also contains one of my favorite editorials, with my favorite girls (click here to see UNCUT VERSION)! BIG BIG THANKS TO THE PREVIEW TEAM! 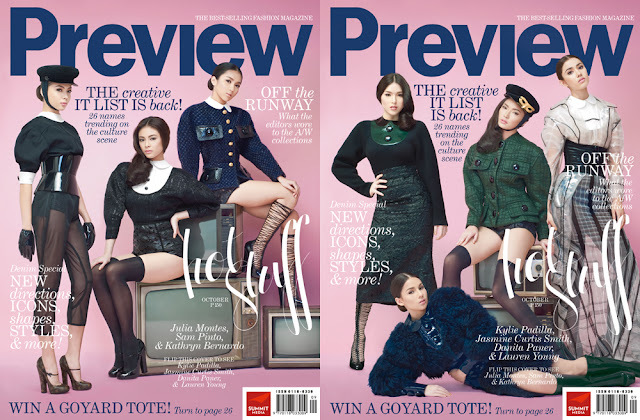 It's a great coincidence that that first issue of Preview that I ever bought, June 2005 (featuring "Television's Brightest Young Stars' with Anne Curtis, Bea Alonzo, Iza Calzado back when they were starting out), would be the same as my first for the magazine!!! This time with the new batch of young stars and one of them is Anne's younger sister, Jasmine Curtis-Smith. To top it off they were wearing one of my favorite Louis Vuitton collections, flown in for the shoot. I was very emotional (I know, gross haha, but seriously I really was) when I found out I was doing this. I really couldn't believe it. To me, it's like coming full circle. Mayganon?? Showbiz' Next Stars: Julia Montes, Sam Pinto, Kathryn Bernardo, Kylie Padilla, Jasmine Curtis-Smitth, Danita Paner & Lauren Young!